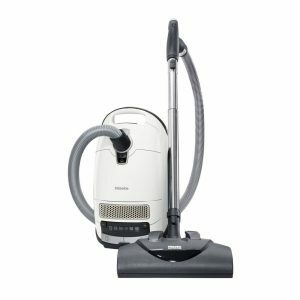 The Miele Complete C3 Cat and Dog is the ultimate vacuum cleaner for those with lots of pets and a fair bit of cash to put aside for a vacuum. 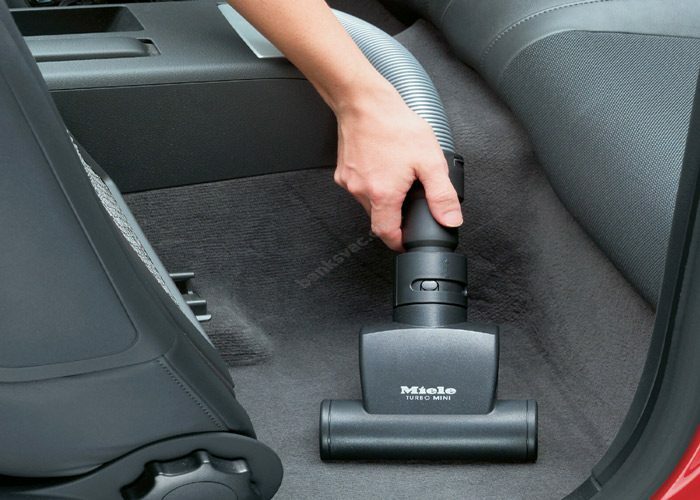 This is the Rolls Royce of canister vacuums and while it doesn’t come cheap, it’s pretty much worth every penny. If only we could get such high quality for less money! Miele traces its roots all the way back to 1899 and has grown to be one of the most trusted household appliance brands in the world today. There are many models in the Miele C3 range, but this is the one specifically designed for pet hair. So, let’s see what makes it so special. The simplicity of this model might surprise you, in terms of looks. It looks like a pretty standard canister vacuum cleaner; mono-colour casing, metal wand, plastic-covered cleaning foot. It’s not unattractive by any means, but if you’re after a super-modern looking machine, it might not be for you. In saying that, the magic of this machine lies in its hidden tools and technology, not its aesthetics. I do like the tidiness and un-fussy look of this model. The high price-point makes much more sense when we get into the technology side of this vacuum. To meet the EU’s new regulations on power consumption the Miele has a 1200-watt power rating.But don’t let this fool you -it’s not how much power you have it’s how you use it. Suction power is only one part of what makes a vacuum an effective cleaner. 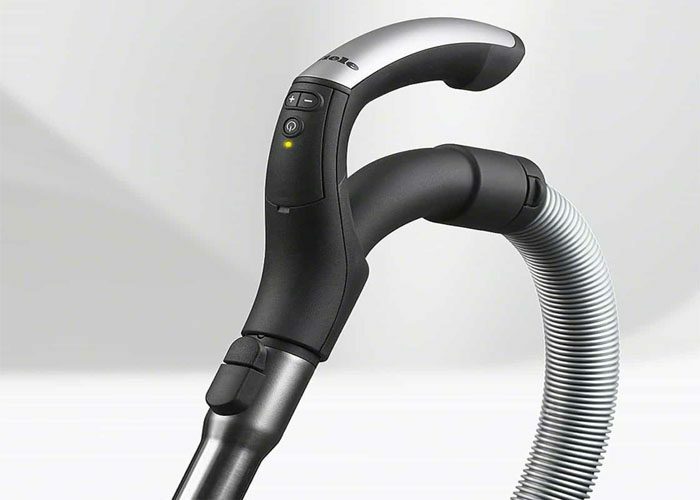 Miele has provided 2 different cleaning heads for different surfaces. 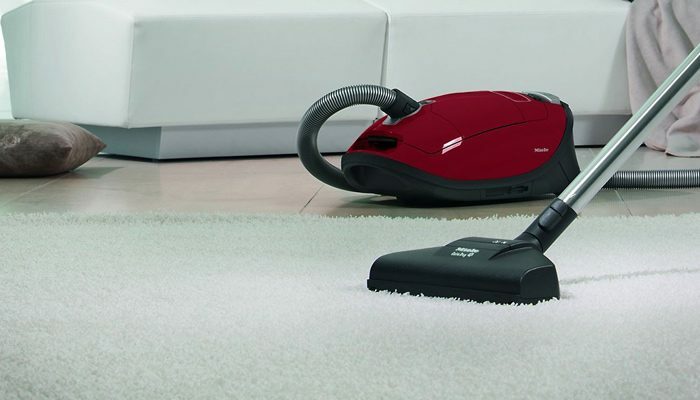 Best for hard floors is theMiele AirTeQ head,while best for carpets is the Turbohead.There are also varying brush-lengths on the main cleaning heads, which you can easily adjust with your foot, to switch between hard and soft floors if you don’t want to switch the head itself. The special pet-hair tool is the STB 101 Hand held TurboBrush. This allows you to really control the force you are using in order to remove stubborn pet hair on floors and upholstery. So many happy users have commented on the effectiveness of pet-hair removal. The package also includes the Parquet Twister…sounds fancy, right? Well, it is. This tool has 180degree rotation ability to allow you to get around tricky areas such as chair legs and corners without having to inadvertently practice your yoga poses! One of the most impressive things about this cleaner is how quiet it is. Some animals (and children!) get agitated by the sound of a loud vacuum. If you’ve got a skittish dog or a light sleeping child then this may well be the cleaner for you. At 73 decibels, this is one of the quietest vacuums you can buy. 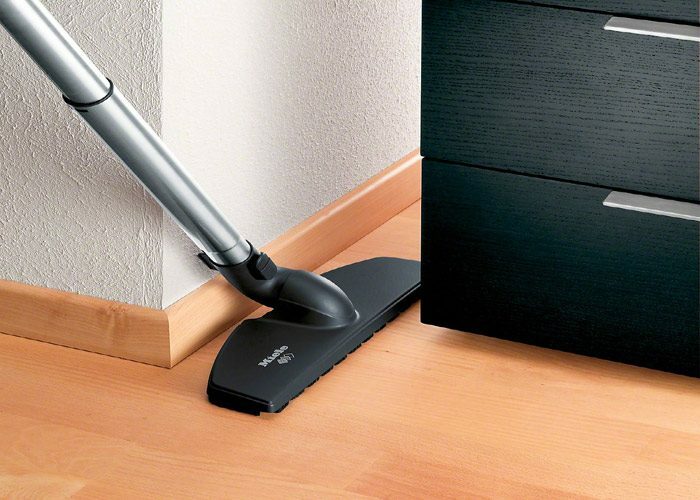 The power cord is approximately 24.6ft in length, and when you add the wand and handle, the total cleaning area is 36ft. I think this is a perfectly acceptable length for medium-sized homes, but you will need to unplug a couple of times if you are doing a whole-house clean. The quality of construction is very high. The canister is lightweight yet sturdy, and the wand is telescopic, meaning you can adjust the length according to height requirements. This is a nice, lightweight machine, at 10.8lbs approximately. If you have stairs, or lots of niggly areas to get into, you won’t have an issue carrying this machine around the house. 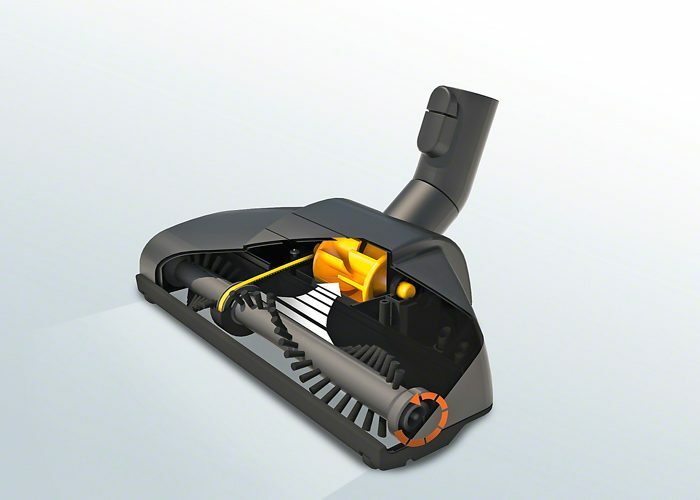 Moving the vacuum when cleaning is made easy by the castor wheels which rotate and pivot as you move. Plus, the wheels are gentle on floors so no need to worry about gauges or marks. Because of the Parquet Twister, maneuverability is a breeze. This accessory is designed especially for hard floors, which often have lots of tables, chairs and other small furniture where dust likes to gather beneath. Getting rid of dust bunnies and dropped pet food (or human food!) beneath tables is simple and easy with this tool. Most of the tools are stored away inside the canister itself, which is great, as you know exactly where they are whenever you need them. Storing the machine itself shouldn’t pose any issues, you might just have to allocate a cupboard-corner in which you can push the canister against the wand/hose to keep it all upright and neat. 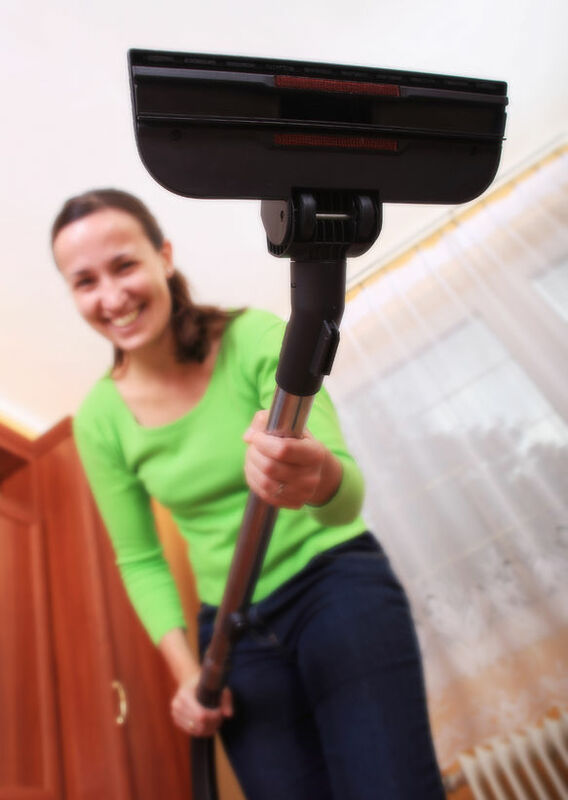 This model is great for stair cleaning as it is lightweight and small enough to sit neatly on a stair as you clean. If you really want to give the steps a thorough clean, it might be best to attach the crevice device, so you can get into each tight corner. The bag holds a very generous 1.18 gallons of dry material. There is a strip which changes color on the canister to let you know when the bag needs changing. To empty it, there are no specific tricks, but as the bag is self-sealing (HyClean bags are used for this model), so there shouldn’t be a problem with mess and dust clouds. You can really trust the Miele Complete C3 to pick up pet hair on whatever floor surface. Even though there are 2 different heads which are better for hard and soft floors, each head can easily handle both, as you can adjust the bristle-height and power level. 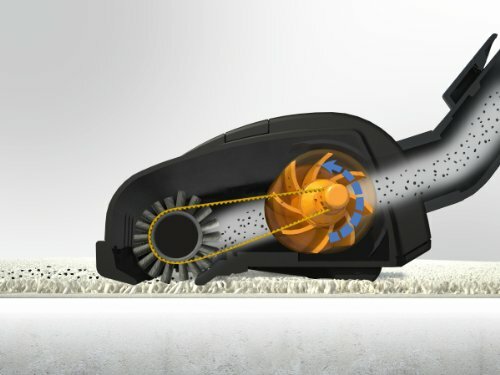 The AirTeQ floorhead is great for hard floors, as the bristles are long enough to glide seamlessly over hard floors, sucking up dust and animal fur (without that horrible suctioning action some cleaners have)! This head is also effective on shorter carpet fibers, if the power is lowered slightly, so you don’t have to work as hard to push the cleaner along. 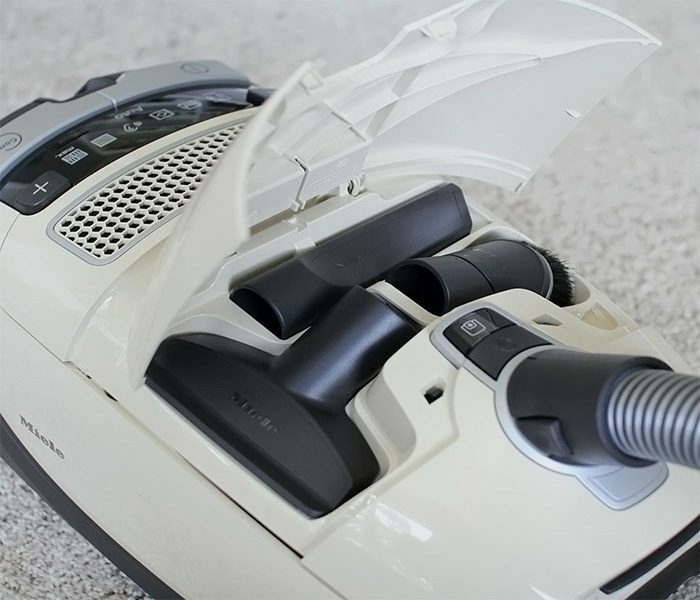 If there’s a particularly bad dry-spill or dirt-deposit on your carpet, you can ramp up the power and really get in there, as the head will mesh firmly with the carpet. For shaggier or fluffier carpets, the Turbohead is best. The power-adjustment feature is handy here, as you can lower it for a second if you are cleaning rugs or other moveable items. 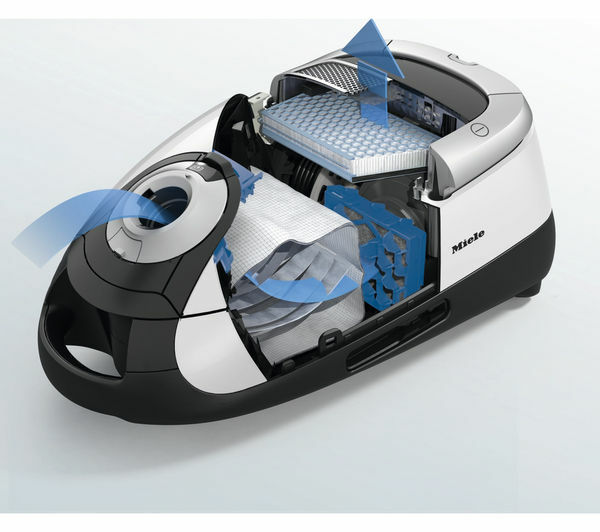 In simpler terms…the Miele C3 Complete Cat and Dog is ideal for all carpet types! This model features the Miele HEPA Active AirClean filter. It has activated charcoal which works to eliminate pet (and other) odors. The high-quality filter inside this model makes it ideal for those with asthma and allergies, as 99.9% of allergens and harmful particles are captured. It will come as no surprise to you that I rate this vacuum very highly. Not least because of the versatility and functionality it offers on all different surface types. Hard-wood floors and carpets can be very expensive, and need to be maintained properly, especially when you have furry creatures who like to shed their hair everywhere. Long-shag carpets can be a nightmare to clean animal hair out of, but the various cleaning heads included with this machine take the pain out of that chore. If you are thinking of taking a step-up and splashing out on a premium canister vacuum cleaner this should be at the top of your shortlist. If you are looking for aquiet, powerful, superior quality canister vacuum that’s going to serve you well for many years and won’t mean having to buy supplementary appliances for different floor-cleaning needs then this is the cleaner for you.